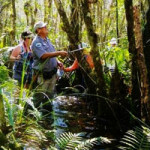 Friends of Fakahatchee: Dedicated to financial and volunteer support to preserve the unique ecology and cultural heritage of Fakahatchee Strand Preserve State Park and educate the public about its importance. Volunteers serve on the Board, drive the Ghost Rider, hammer the nails and clear the trails. They interpret on the trams and Boardwalk and perform acts of citizen science. Read on to see how you might use your skills and interests to volunteer and become a very good Friend to the Fakahatchee. You don’t have to be a naturalist to drive the truck that pulls the Ghost Rider tram. 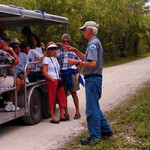 Likewise you can provide a vital service by accompanying our naturalists on swamp walks or coastal cruises. Sooner than you realize you may find yourself becoming one of our volunteer naturalists. All of our adventures are led by qualified volunteer naturalists. Some have advanced degrees and years of experience. Others are self-taught with a love of the environment and ability to education. 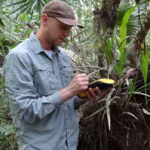 Our program chairman, a Florida Master Naturalist and Certified Interpretive Guide, can provide any training you may need. 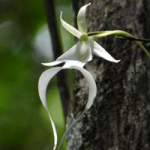 Park biologists are working to restore “lost orchids” to the park and protect the park’s existing species through persistent propagation and distribution. Helping move supplies and keeping records are two roles volunteers can play in this important activity. 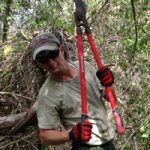 If swinging a machete or running a chain saw is your idea of fun, the Fakahatchee Strand offers plenty of opportunity for your skills. Trail clearing crews of volunteers are in the park almost every weekend and would welcome your help. There’s also lighter work: join the team brooming the boardwalk! If you have a scientific or statistical bent, there are a number of research projects underway in the park where you could make an important contribution. Many members find fulfillment in carrying out the many administrative tasks that all organizations need. Membership mailing, newsletter writing and production and organizing dinners and events are all critical to our success and largely insect free! We Build. . . We FAKA-hack! 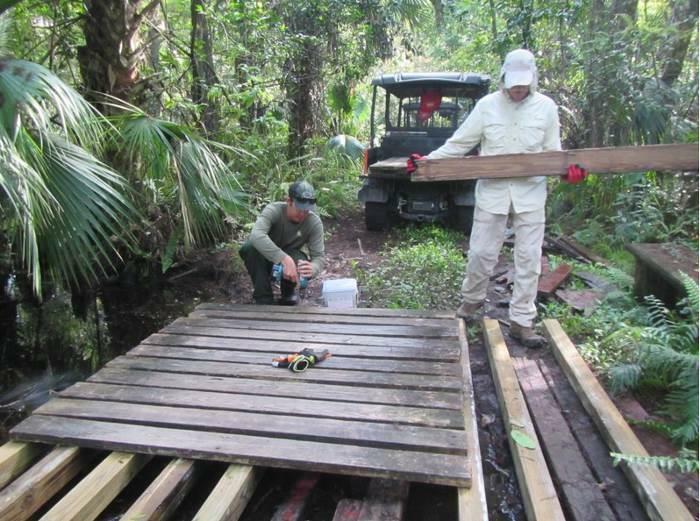 On Saturday October 10, 2016 FAKA Ranger Extraordinaire Steven Bass, Howard Lubel and myself headed out to West Main to rebuild a bridge over the collapsed culvert just west of the cabins – approximately 1.5 miles west of the gate. We removed the old/loose materials using both of our FOF Kubotas, a portable generator, an AC power drill, DC battery power drills, and a big box of wood screws. We then laid out 4×4’s and planks in an optimum design maximizing strength, thus providing superior support for the traffic it will need to endure. Anyone interested in a good hearty workout, outside in the fresh air, in a remote yet scenic environment, please come on out and join the Fearless FAKA-hackers on a volunteer work day. We start at 8:30 a.m. and try to finish around 3:00 p.m.
Each year we clear paths for the Ultra Marathon. We schedule special work days in November, December, January and February, but we work most weekends somewhere in the Fak. Please contact me at sunnyg8tr@aol.com if you are interested. Eric Draper, Jane Parks, Patrick Higgins – Jane receives the 2018 Mel Finn Award. 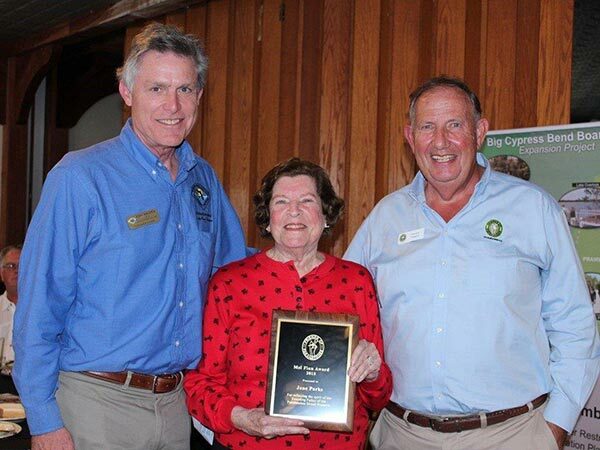 FOF President Patrick Higgins presented the 2018 Mel Finn Award to Mrs. Jane Parks, in recognition of her outstanding efforts to save the Fakahatchee from real estate development. 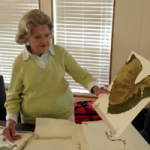 “In the early 1960s, years before our organization existed,” he said, “she was working tirelessly to preserve the Fakahatchee as Chairman of the Junior Women’s Club. She organized an aggressive letter writing campaign and presented a petition to the state in support of preservation, on a roll of paper 175 feet long. Eric Draper, Director of Florida State Parks, also praised Mrs. Parks’ many contributions, and ” Francine Stevens added, “Jane does not brag, so we have to brag for her.” Thank you and congratulations, Jane! Read more about Mel Finn and the award in his honor here. See a list of previous recipients here.